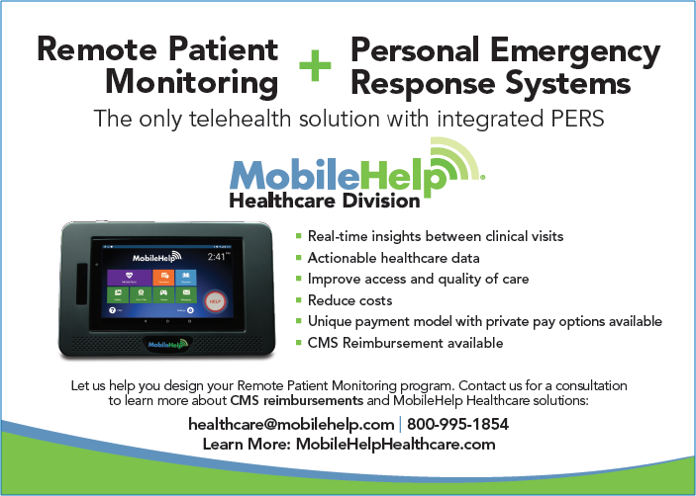 October 3 – 5 | Capital Hilton | Washington, D.C.
Stop by Table #35 to find out more about MobileHelp RPM Solutions. Chris A. Otto, SVP, MobileHelp Healthcare and Jerriene Cordova, Director of Telehealth Programs, will be demonstrating the MobileVitals Touch Remote Patient Monitoring System, providing consultations and discussing CMS reimbursement opportunities. Fill out the form below and we will contact you for a consultation. Or call 800-995-1854. By submitting this form, you agree to give your electronically signed prior express written consent and authorization to be contacted by or on behalf of MobileHelp on your wireless and/or other phone numbers you provided above, including by SMS/texts, autodialed, pre-recorded and/or artificial voice calls, for the marketing of MobileHelp goods or services even if you are on the federal, any state’s and/or MobileHelp Do-Not-Call registry or list and for all other purposes. You understand that your consent is not required to purchase MobileHelp goods or services.